Marten Kuilman (1947) was educated as a geologist at the Free University of Amsterdam (Nederland). The exploration for base minerals brought him to countries like South Africa, Zimbabwe, Ireland and Australia where he tried to unravel the secrets of the earth history. The search in the different countries yielded geological results, but also impressions of unprovoked poverty, human misery, unashamed wealth and expense accounts. The general disinterest in creative thinking put the sense of life as a young company man in question. He decided to quit his multinational career in order to concentrate on the challenging project of reflective exploration. The journey that followed was, as could be expected, a lonelier one, but more rewarding in the long run (fig. 856). Fig. 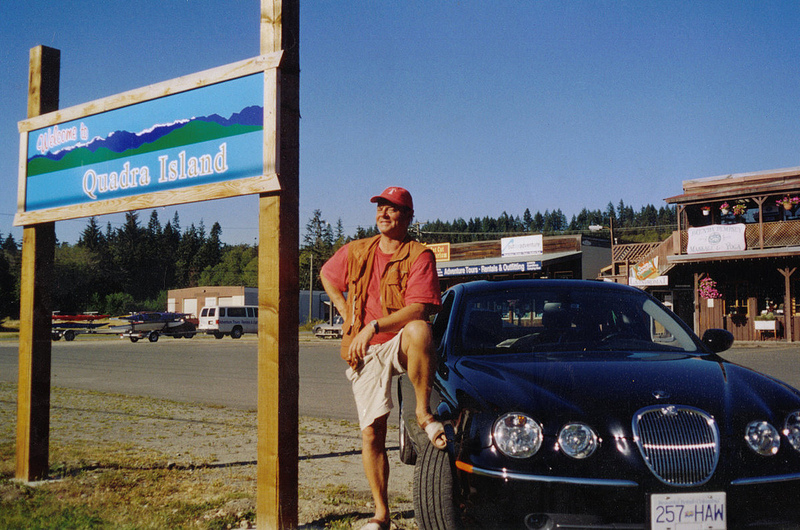 856 – The author at the welcome sign of Quadra Island, British Columbia (Canada) on the 7th of August 2005, aged 58. The island in the Strait of Georgia was named after the eighteenth-century Spanish naval officer Don Juan Francisco de la Bodega y Quadra, but also has a special meaning for a researcher in the quadralectic philosophy. The practical exploration motto ‘if you look for something, you will find it’ is also applicable in the field of philosophical inquiry. The only problem was a doubt as to where to look for at the outset of the journey. Maybe the best indication was a general feeling of uneasiness with regards to the way history was written. The narrators of civilized achievements, and the teachers, who transferred their message, seemed to be only interested in the bloody aspects of the past. Wars, turmoil, bloodshed and insurrections were presented as the essential pastimes of the human race. And times had hardly changed, because these very subjects were still the stuff of which newspapers and television reporters were interested in today. However, what is the alternative? Is there a way of historical consciousness, which is not inspired by the ugly things of life? The search was on and the geological, and in particular, the stratigraphical background, helped a great deal in finding my way around. The given ‘facts’ had the same, rather vague status as fossils, the petrified remains or traces of once living animals or plants. A fossil gains relevance when it was placed in a temporary and spatial context. The arte’fact’ had to fix a bond with its finder: only in their mutual togetherness there was significance. This insight, which was practiced in the field as a geologist, also held the key to the ensuing philosophical inquiry. The relation between the observer and the observed was placed in a theoretical setting and the questions of limitation and shift were asked. A breakthrough occurred in 1983, at the age of thirty-six years, when it was realized that visibility is (or better: could be) a four-fold affair. The secure world of black and white became more and more colorful. A search for the beginning of empirical visibility started. Its conventional place in the middle of a communication was questioned, and it was soon realized that the beginning in a cyclic environment is hard to find. The search focused on the theoretical relation between divided units moving along each other in a cyclic way. An arithmetical model was developed, which transposed the numerical values of the points of contact into a graph. This communication graph (CF-graph) was interpreted as a universal representation of any (cyclic) communication, which was based on a four-division. This type of division was – a priori – chosen, because it offered the richness of its subdivisions (quadrants), and could still be comprehended by the human mind without the act of consciously counting the individual parts. The road to further discoveries was wide open once the arithmetical foundation of the four-division was comprehended. Cultural history got a different face, and the known facts sprang to life when they were placed in a cyclic – but not necessary recurring – context. This new way of observation was the outcome of a system of thinking, which was labeled – with a neologism – the quadralectic philosophy. The structural framework has a distinct reference to the time-honored efforts in the direction of tetradic thinking, like Empedocles’ theory of the elements. The four-fold way of thinking was also subscribed by the medical men like Philistion and Hippocrates in the theory of the humours. Philosophers like Pythagoras, Aristotle and Epicures further advocated the multiple approach. The tetradic way of thinking was fully accepted by the Scholastic savants of the Middle Ages in their interpretation of the Scriptures by using the doctrinal formula of the four senses (anagogia, allegoria, historia and tropologia). These ancient thinkers opened the path through the woods, cutting away the obstructing undergrowth of oppositional thinking. However, none of them joined the cognitive compartments into a logical framework of valuated observation. The reason might be that most scholars – with the possible exception of Empedocles – followed a linear line of thinking. It is only in a circular environment that the interaction of the observer and the observed can be faithfully represented. The human observer looses its central position in this type of communication, but is part of an eternal interaction, which determines the way of seeing. The political and cultural achievements of mankind can now be subjected to a new inquiry, both on a macro- and a micro level. The lives of all humans, including our own, can be compared to the intervals of the CF-graph and conclusions can be drawn based on the degree of distance. The same identification can be done for the great cultural periods like those of the Egyptians, Greeks or Romans, which provided the combined narratives of millions of people in time. These historical eras can be studied into the greatest detail. The only requirement is a ‘subjective’ choice of two moments in time, which compare with the theoretical boundaries of (visible) visibility in the universal CF-graph. Two points of recognition (POR) are sufficient to draw the whole cycle of interaction. It was realized that subjectivity entered the investigation at this point, but the writer knew from experience – from his practical work in the stratigraphical field – that interpretation is a given necessity to reach results. Personal choices are constantly being made in any observation. A pledge to ‘objectivity’, which is still proclaimed in many traditional scientific operations, cannot be upheld. There is no opposition between objectivity and subjectivity any more in a modern approach to science. The only requirement in an investigation is our personal integrity and honesty to indicate the moment of choice and, preferably, provide the inner motifs of the selection. The writing of ‘Quadralectic Architecture’ started in April 2002 and can be seen as the third part of an intended quadrilogue. These four books follow, more or less, the quadrants in their way of thinking. The first part/book was called ‘Four. A Rediscovery of the ‘Tetragonus mundus’ (November 1996; 587 pp) and treated the wide field of the fourfold division in a general way. The tetradic imaginary was collected in a ‘trial-and-error’ way, being driven by curiosity rather than following a strict script. The second book (‘Visions of Four Notions’; November 2001; 298 pp.) dealt with the theoretical aspects of the quadralectic philosophy. It is far more a meditated piece of work. The principal intention was a faithful description of the theoretical conception of the universal communication graph (in the English language, the original version was finished in 1992). However, a simple pursuing of the line of inquiry led to some significant discoveries. The finding of an ‘asymptotic’ observer in the universe was the most important addition to the original work (written in Dutch). The present monograph deals with ‘Quadralectic Architecture’ and is, in many aspects, down to earth. It is concerned with the numerous human endeavors in the material world. The visible graphic elements of circle (I), cross (II), square (III) and octagonal/polygonal/grid (IV) were seen as the symbolic-archetypal renderings of the quadrants. Their application in the design of buildings was followed throughout history. The relation between the various architectonic elements and a tetradic imagery was placed, where possible, in a cultural context. The fourth book has not yet been visualized by the writer, but will be in the spirit of the ‘Fourth Quadrant’. The position of the writer in relation to the quadralectic philosophy will be emphasized. Subjectivity will be studied as a strategy of understanding and survival. The theatrical theme of a newly discovered insight not being known to the world might be placed – as a personal relief – in a historical context. Maybe the last book of the quadrilogue has to deal with the great dilemma of choice, visibility and the consciousness of scale. The decision to convert a subconscious, materialistic outlook into an effort to find the tetradic universe offered the rewards of a cerebral experience. A deeper appreciation of man and mankind proved in the end – which is not an end, but rather a beginning – a formidable way to make life worthwhile. A comparison with the ancient Egyptian cultural presence – as found in the analogy of the CF-graphs – reveals that an actualization of the four-fold way of thinking will probably occur in the European cultural period in the twenty-second century. A ‘Late Renaissance’ will start at that time, just like it did in the Egyptian cultural period during the sixth century BC. A form of glory was reserved to the last phase of visibility, although later historians might call it decadence. To have spotted this historical process some hundred and fifty years in advance might be a solace for the writer in an expedient reaction to the lack of understanding during his lifetime. The present book seeks primary a familiarity with the quadralectic way of thinking in the field of architecture. One cannot help but wonder if such a complex endeavor can ever be successful. The writer, on his part, would be glad if the reader can pick up a sparkling glance of the quadralectic world as it is hidden in the visible objects of architecture. Greetings Marten (and also Gitta), I just came across your impressive study and am printing the section on The Quadralectic Theory. I sense it will be invaluable as I try to finish my book called Out Of Square, which is a study of Diagonality in art and architecture. I may have some questions for you as I work through what you’ve written. You both may find interesting the Preface and the Introduction to my book, which appears on my website joellevinson.info You will find them under Writings > Special Projects > Diagonality. ‘Diagonality in art and architecture’ came as a Christmas present from Philadelphia. I unpacked it with the eagerness of a child under the Christmas tree. The encounter with a researcher with new lines of thoughts is a moment of joy. You give, indeed, a challenging view on an aspect of architecture and the phenomenon (of diagonality), which makes you think of the place and importance of the oblique in the creative process. Your search has similarities with my own efforts to look at architecture – and the creative process in general – in a different way. The major difference is the position of the observer in terms of division thinking. Diagonality is the intermediary between the horizontal and the vertical and together they form a three-some: their interplay is in the realm of the three-division. This is fair enough: many great discoveries were made when the two-fold (oppositional) frame of mind was left behind and a third element was added to enhance the field of valuation. Your search for the occurrence and meaning of diagonality proves this point. A triangular construction offers a different perspective – like the Egyptians already knew in their pyramids. However, one has to remember that the base of these structures consisted of a square and pointed to the four-fold. The (modern) tetradic type of division-thinking is a further reduplication of the narrow, oppositional path. The ‘distance’ is created in the realization of a shift between the observer and the observed and is valuated in a circular environment. This cognitive effort is widening the scope again. I am very curious in the continuation of your research and would be glad if you keep me informed. PS. There are many examples of the ‘four-fold’ (in the widest sense) in the DOC-files (albums) of my Flickr-account ‘Quadralectics’. Hi Marten, I appreciate your writing back. I will look again at the one article of yours that I read and will also look at your other articles/albums in the Quadralectics folder. But I have to not do that immediately. I am seventy-seven years old (hum . . . actually today is my birthday) and have been researching and writing on my theme for 50 years. So I have promised myself to stay focused until the writing of my book is finished and not keep adding to my vast archives of information. But I will try to remember to send you chapters as I finish them. I am trying to get in contact with whoever created the yurt illustration Fig 531. I am just creating my business and would like to use it in my logo so looking to get permission. The company is Becoming Bohemian Retreats. Fig. 531 (p. 656) – The yurt. P. 88 in: SPLUNTER, van, Job (1994). Esoterie & Architectuur. Speurtocht naar het ontstaan van vormen. Elmar BV, Rijswijk. ISBN 90389 02018. I have a similar request as to that made above. I am wondering what the copyright/ ownership status is of Fig. 650 as I am hoping to obtain permission to use it in a book. The source is: Fig. 650 (p. 791) – Various ideal cities from the Renaissance. TABARELLI, Gian Maria (1974). La ‘cita ideale’ e l’arte della fortificazione nel Rinascimento. Pp. 38 – 57 in : CERIOTTI, Guido (Ed.). L’Illustrazione Italiana. L’uomo, le armi, le mura. Anni I, numero 2, 1974. Bramante Editrice, Milano. If there are any rights, you should ask the above given source (if possible). You can use the illustration freely as far as I am concerned. Marten Kuilman, Amsterdam.